WARNING: I WILL FLOAT MY OWN BOAT. PROCEED WITH CAUTION. So when I got my teacher evaluation last year and ranked "proficient" instead of "exemplary" in all 10 teacher evaluation areas: professional knowledge, instructional planning, instructional strategies, differentiated instruction, assessment strategies, assessment uses, positive learning environment, academically challenging environment, professionalism, and communication; I was a little disappointed. The only thing I could take solace in was knowing that I was a first year teacher and that my evaluation was based on a combined total of 1 hour and 40 minutes of administrative observations (our school employs around 200 staff members.. so there are a lot of people to be observed and assessed). So this year I have made it my personal mission to step my game up and try shining even brighter at my school. 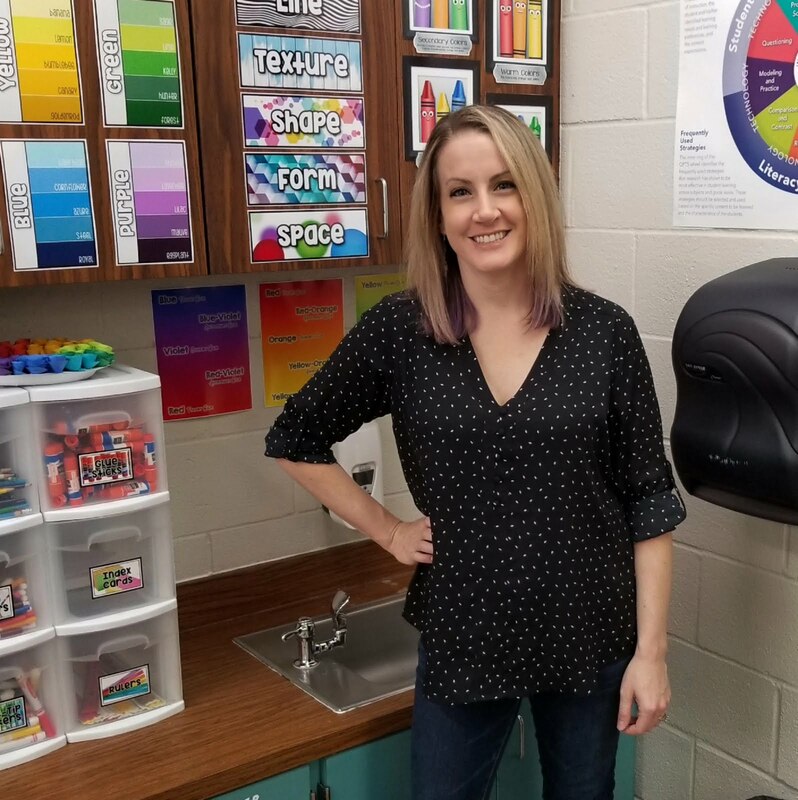 I already know that my abilities and effectiveness as a teacher are far greater this year than last (yay for year two)... but I still felt like I needed to do more. I've already volunteered to be a committee member on a few different school committees, have taken up writing an arts integration column for our school's weekly teacher newsletter, have gotten involved in a local charity benefiting the visual arts programs of local schools, headed a new marker recycling initiative at my school, and am now presenting a session at our state art educators conference ("The Art of Blogging: Surviving the First Year Through Social Media and Technology"). Of course I will be looking for additional ways to get involved (I WILLLLLL BE EXEMPLARY) but for now I really just want to take the opportunity to tell you a bit more about the charity and marker recycling initiative. I must admit that my involvement in the "Chairs for Charity" event was mostly driven by my school's other full-time art teacher (who is crazy amazing herself) and I'm glad we did it! 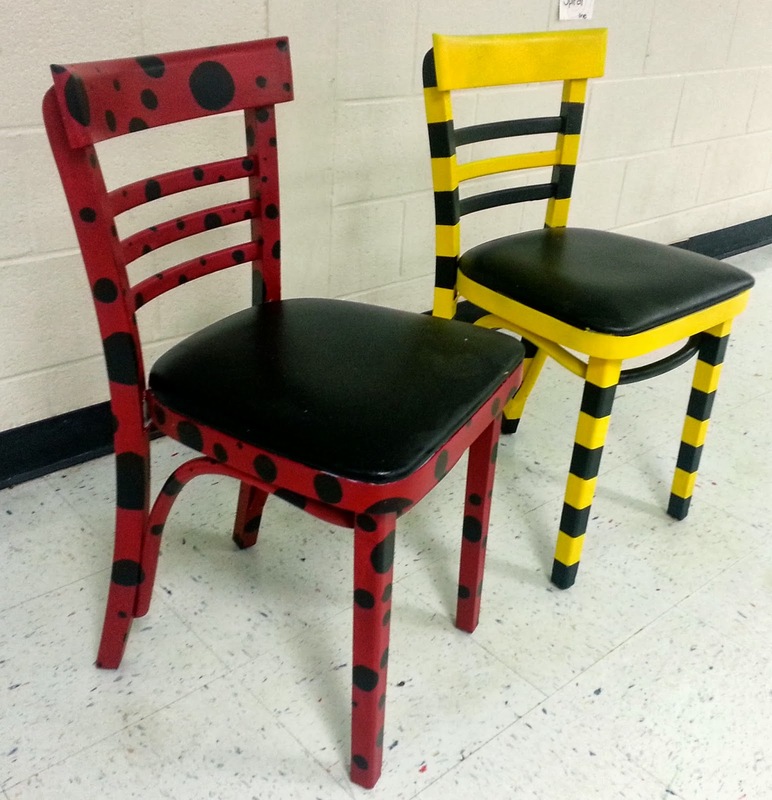 "Chairs for Charity" is a silent art auction in which attendees bid on previously old and worn chairs which are then re-envisioned and creatively painted by art students from local schools. 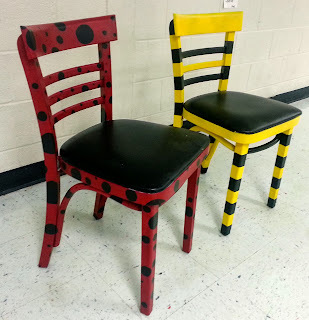 My colleague and I decided to do two chairs for the auction - one painted by my art club and one painted by her art club. They turned out super cute!! one yellow and black (either bumblebee themed or Georgia Tech themed). We figured this would appeal to a greater audience. The auction isn't until this weekend so I'm not sure how much they'll go for... but I guess we'll see! Next I wanted to tell you guys about the marker recycling initiative that I am heading at my school. The Crayola ColorCycle program is a marker recycling initiative started by the Crayola company. 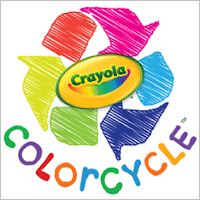 Schools sign up on their website, begin collecting dead dried up markers, and then send them (free of charge) to the Crayola company. The company then sends these markers to another manufacturing facility run by an outside company who then melts down the thick polyethylene marker shell and turns it into a liquid clean-burning fuel. According to Crayola, just one pack of recycled markers is enough to cook an egg, make toast, and brew one pot of coffee; so just imagine what millions could do! 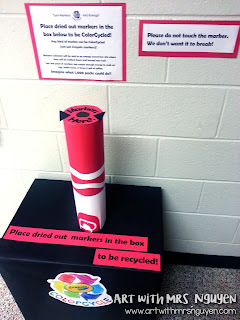 In order to get the kids excited about this recycling program I've made a really cool looking collection box which sits outside my classroom door so whenever kids have dried up markers they'll get excited about getting to put them into the box! I'm also currently working with one of my 4th grade classes to create an extremely entertaining commercial advertising the program, which will later be aired on the morning announcements. Wow!!! I'm tired just listening!!! I know sometimes you have to remind Admin of accomplishments they do not see. Such as involvement in NAEA, outside but art ed related organizations, etc. But, keep going, your students are very lucky!! !